Mound-Makers is a Covenant in Dark Souls 3. A malformed vertebra found by the mad, with a queer symbol on its inside, proof of the shackles of the Gods. Equip to pledge oneself to the Mound-makers covenant. The mound-makers wish only to add to their mounds, becoming mad spirits whether summoned as co-operators or invaders. They are blithe to those around them, for in their minds, any kill might lead to another shackle. You must obtain the item: Mound-Makers and equip it. Before killing the Curse-Rotted Greatwood boss, start at the Undead Settlement bonfire and continue through the house until reaching the camp with an Evangelist near a burning pile (where you find Loretta's Bone), from here take a right and cross the wooden bridge. At the other side of the bridge there's a bunch of crates and barrels, break those and walk behind the stables insted of entering. Behind a small house with a ladder is a cage spider NPC, it will give you a hint that there's something fishy going on with a cage. Climb up the ladder of the small house, then drop off the roof on the right side. You will see a large guy with a cage on his back, approach his cage and use the action button to examine it. A cutscene will appear and you will be teleported to the area where an Holy Knight Hodrick gives you the covenant. (Does not work with summons or while being invaded). After joining the covenant there is no apparent way to leave the area apart from using a Homeward Bone (Hodrick will give you one if you talk to him for the third time), but a quit/reload will spawn you back at the settlement where you entered the cage, without reviving everything you had killed up to that point. If you kill the Curse-Rotted Greatwood before acquiring the covenant, go to the entrance of the boss room after having defeated Aldrich. There you can activate the summon sign of Sirris of the Sunless Realms and join in cooperation. If successful, you will acquire the Covenant. You must not have turned Sirris hostile towards you. If you kill Curse-Rotted Greatwood before acquiring the covenant AND failed the questline for Sirris of the Sunless Realms for whatever reason, it will be impossible to acquire the convenant's insignia until your next journey/playthrough (Tested by DD: I've killed the Greatwood & didn't know about the Hollow Manservant (Cage Bearer "enemy") then offered a Pale Tongue to Rosaria while following Leonhard's questline and this failed Sirris's questline). How you enter a host's world dictates how you can interact with the world. You can either be summoned via a White Sign Soapstone or invade using a Red Eye Orb. When using the summon sign you are placed in the friendly phantom slots for the host. You can kill any phantom and the host. You also can attack and kill the enemies in the hosts world. However you cannot enter a boss fog with the host. You will be sent away when the host enters the fog. If you invade as a mad phantom you can only hurt other phantoms and the host. Killing the host will send you home with your reward. Regardless of how you enter the hosts world other mad phantoms can attack and hurt you as well as any phantom or host. The only thing that changes hostility based on how you enter is the pve enemies which are no longer hostile to you when you invade. The white phantom ring does not change your summon sign from purple to white. Whether you use the white soap stone, red soap stone, or the red eye orb a mound maker phantom will always appear as purple as well as the signs you place. It is worth noting that, even if you did not obtain the covenant equip item in a playthrough, you may still turn in vertebra shackles obtained through other means for the covenants rank rewards. Players can increase their rank in the covenant by offering acquired Vertebra Shackle Items at the altar in the Pit of Hollows where you face Curse-Rotted Greatwood in the Undead Settlement. Acquire these by defeating the world host; being present for the death of up to 3 phantoms of any type, the exact number of which is determined by the existing number of non-Host players in that world; or defeating any Mound-Maker who invades you. They are also rare drops from large red-eyed skeletons in Catacombs of Carthus. 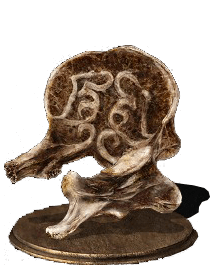 Hosts who defeat a Mound-maker invader will receive a Vertebra Shackle as well, but this does not apply if the Mound Maker invaded by means of Red Sign Soapstone. A cheesy way to farm Vertebra Shackles is to have two Mound Makers summon each other repeatedly and allow the invader to kill the host. The rank requirements are additive, meaning you only have to earn a total of 30, not 10 and then another 30, to obtain all covenant rewards. A slow & steady offline way to farm Shackles is to travel from the Catacombs of Carthus Bonfire, right past the ball trap & out the left hall to the two large red eye skeletons which each have ~1% drop rate. This will also net a large number of Titanite Shards & Large Titanite Shards as well as frequent Carthus Shield & Curved Sword drops. I&apos;m trying to get the Master of Pyromancies Achievement and I need the Warmth pyro. Anyone willing to help me reach rank 2 on this covenant? xbox1 gt: Charles2Bston3r Just message me. [PS4][SL120][Dixie69Normus] lf someone to mutually farm or otherwise pay for this crap. Need like 23. You know, the glitch that used to exist that allowed you to invade and be able to enter boss rooms as a mad dark spirit, I wish the covenant was like that by DEFAULT. Mound-Makers and mad dark spirits have one thing that defines them : chaos. Being able to invade/being summoned as a mad dark spirit, be able to attack any host, phantom, dark spirit, mad dark spirit and PvE enemy would emphasize on that chaos aspect. You wouldn&apos;t know if the mad dark spirit was there to help you or to be against you. Again, while it sounds bull*****to be killed by an invader in a boss room, take in consideration this ; you&apos;d have the option to (try to) kill the mad dark spirit if you didn&apos;t trust them to be on your side for the boss fight, or if you don&apos;t want them to come. If you let them, you would fight the boss as usual and figure out if the mad dark spirit is actually there to help you or to mess with you all along. This unknown choice, this gamble, quite represents the chaos side of the Mound-Makers and I REALLY wish the covenant was like that to make it special, rather than have to resort to glitches, exploits or probably Cheat Engine for that. Anyone here want&apos;s to help me out on PC? So can I join his covenant in new game+ since I can&apos;t now that I&apos;ve killed the Curse Rotten Greatwood and joined Rosaria&apos;s covenant too?? Seems I become a member of the covenant after helping her kill her grandfather, despite not having that green blossom with the inscription. Happened with 2 different characters. Look, new mound-makers - when you invade a large group with another invader present you need to either kill the host or 3 phantoms. If you want to try and kill the fellow invader for one of your 3 phantom kills that&apos;s fine, but for *****&apos;s sake at least wait for a couple kills. If you attack right off the bat all you&apos;ve done is turn a 4v2 into a 5v1, and you don&apos;t need to be too bright to see the problem there. Page should really be updated to mention that you can&apos;t meet Hodrick if the fight against the Curse-Rotted Greatwood reaches the point where you fall into the pit - if you die after that point, you&apos;ll be locked out of the covenant despite the CRGW still being alive.